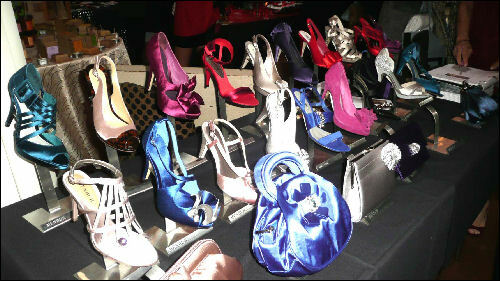 Celebrities including Antonio Sabato Jr., Gilles Marini, and Diedre Hall stopped by the 2nd Annual Valentine Romance ‘Sneak Peek’ Oscar Suite at Café La Boheme to donate their gently used and new shoes to The Ashe Foundation, a non-profit that delivers shoes to the homeless and African nations. 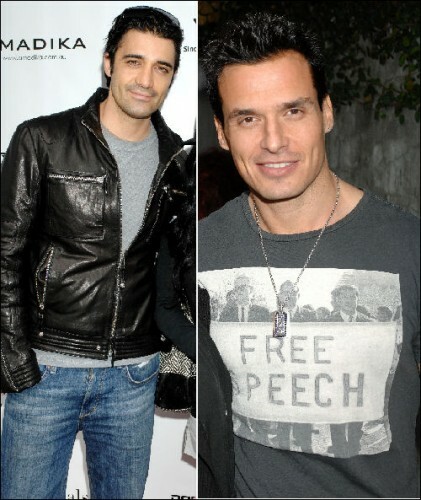 Gilles Marini and Antonio Sabato, Jr. The ladies got beautiful with makeup by Skinn from Dimitri James, CellCeuticals anti-aging skincare for all ages, handmade all natural vegan face and body products from Herban Body Care, and quick drying Dazzle Dry nail polishes. The ladies also picked up fully beaded gowns from Scala Eveningwear, Menbur shoes and handbags to match their dresses, one-of-a-kind jewelry made with precious stones from Miles McNeel Design, and sterling silver jewelry with fresh water pearls or precious stones from Australian company Amadika. While the ladies were styled from head to toe, the men received Jorg Gray watches and were custom-fitted for suits and shirts by the famous Art Lewin. They also took home luxurious Free Beneath robes for men and women, Not Just Any Old Day calendar keepsakes, Pineapple Electronics earwoofers that will let the stars hear and feel the music, Plantronics headsets, Mobigrip, a gadget that sticks to your cell phone so you can use it without ever worrying about dropping it, SpinGym full upper body workout with Forbes Riley, a selection of Traveler’s Choice luggage that included hard cases, duffel bags, and garment bags. What’s a Valentine’s Day event without some chocolate? Antonia’s Nuts had caramelized pecans that are slow roasted to perfection before being covered in chocolate, and Mignon Chocolate gave away their ‘M’ Collection, which is made with dark chocolate. They quenched their thirst with Steaz organic sparkling green tea, Aquamantra water, Blue Angel Ultra Premium Vodka, or Vermeer Dutch Chocolate Cream Liqueurs. Café La Boheme’s 5-star executive chef, Christine Banta served appetizers and lunch that included delicious brioche lobster rolls, Maryland-style crab cakes, seared tuna tataki, mini French dip sandwiches, andouille sausage rolls, wild mushroom tartlets, sesame chicken salad with tossed cashews and red ginger vinaigrette, miso glazed salmon, sliced beef tenderloin, butterscotch pudding parfait, crème brulee and assorted petit fours. The event was awesome. We were fortunate to meet so many stars that will be wearing Art Lewin & Co. Custom Suits & Shirts. We are one of the leading custom clothier in Country. And, it was our pleasure being invited to this event. Doris & Kathy did an amazing job at putting it all together. We are grateful to have been included in the Oscar Suite for Valentine’s especially with our I AM LOVED Water. AQUAMANTRA is the first company in the United States to put its Premium Natural Spring Water in Biodegradable and Recyclable Bottles. The celebrities were loving our Organic Jute Bags – Totes that carry our delicious 1L bottles of I AM LOVED, I AM LUCKY, I AM HEALTHY and I AM GRATEFUL… you can see pics at our website http://www.aquamantra.com or at my Blog http://www.aquamantra/blog – Blessings and Love! Thank you Doris and Kathy! 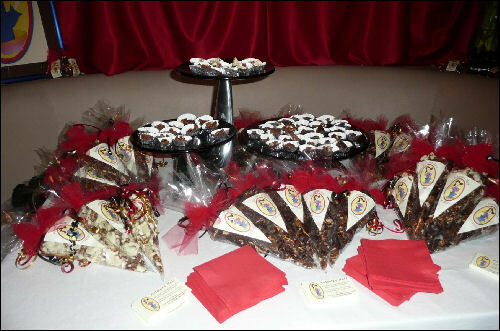 What a wonderful Valentine/pre Oscar Gifting Suite Kathy and Doris hosted at the beautiful Cafe La Boheme. Antonia’s Nuts would like to send our thanks and love for including us in such a beautiful celebrity filled event. As always, the look of enjoyment that passes over each celebrity’s face as they sample Antonia’s Gourmet Caramelized Pecans are priceless and our photos will be available to view as soon as our new website at http://www.antoniasnuts.com is launched this Easter week. Thanks again Kathy and Doris and here’s wishing all of you a delicious day!